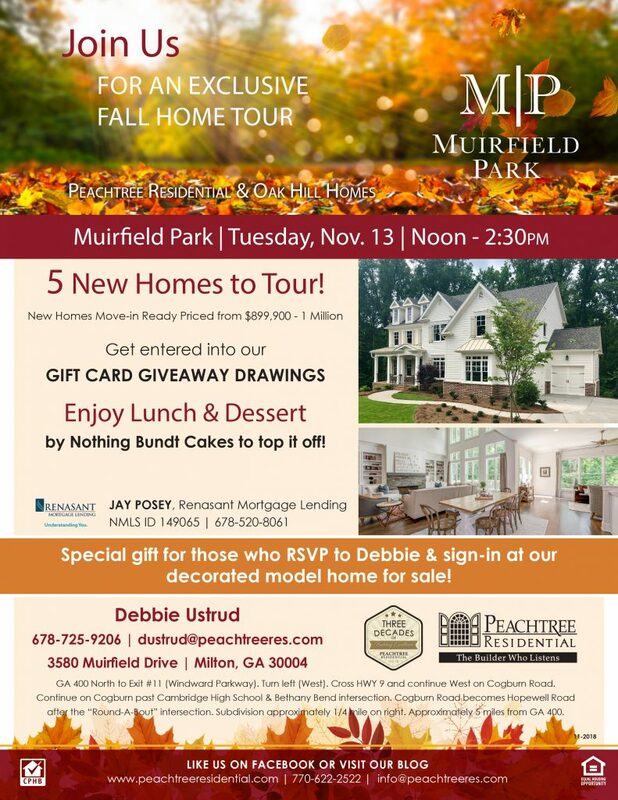 Atlanta area real estate agents are invited to join us for an exclusive Fall Home Tour at Muirfield Park in Milton, Georgia. Peachtree Residential and Oak Hill Homes will showcase five new move-in ready homes priced from $899,900 to $1 Million on Tuesday, November 13 from noon – 2:30 p.m. This will be a delicious break from the holiday hustle and bustle. Agents will enjoy lunch, gift card drawings and dessert from Nothing Bundt Cakes. Those who RSVP to Debbie and sign in at our decorated model will receive a special gift. RSVP at 678-725-9206 or via email at dustrud@peachtreeres.com. The five move-in ready homes range from four bedroom, four-and-a-half baths to five bedroom homes with five baths. These executive homes are offered in an exclusive gated community of only 14 total home sites. Beautiful wooded lots offer acreage ranging from 1 acre to 2.4 acres. 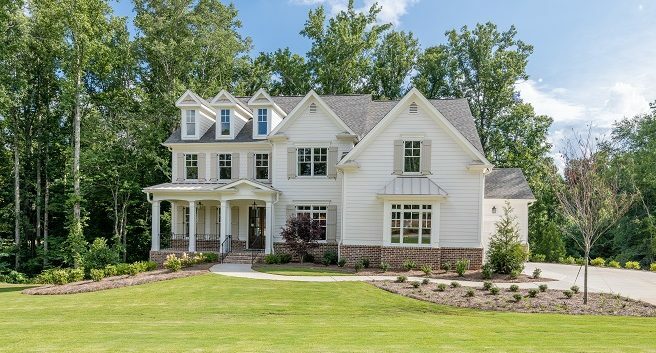 Homes at Muirfield Park offer two-car side-entry garages and an attached third car garage. Home buyers can choose from seven open floor plans with beautiful exterior elevations. Several home plans include the owner’s suite on the main. High end features such as site finished hardwoods, cedar wrapped stained beams, 10 foot ceilings on the main floor, carriage style garage doors, irrigation systems and executive trim are standard. Muirfield is located at 3580 Muirfield Drive, Milton, Ga, 30004. Take GA 400 North to exit 11 (Windward Pkwy). Turn left (West). Cross Hwy 9 and continue west on Cogburn Road. Continue on Cogburn past Cambridge High School and Bethany Bend intersection. Cogburn Road becomes Hopewell Road after the “round-a-bout” intersection. Subdivision is approximately ¼ mile on the right. About 5 miles from GA 400. For more information on the Fall Home Tour or these new Milton homes, call Debbie Ustrud at 678-725-9206 or visit Muirfield Park on the Peachtree Residential website.